“Truly, of all the endless things once can make with color, none withstand the shock of wind and water as does mosaic.” With these words Giorgio Vasari, a historian from 1500, affirmed the long-lastingness of mosaic. Domenico Ghirlandaio, the painter in whose studio Michelangelo apprenticed, said “The true painting for the ages is mosaic.”This causes me to think that to beautify his buildings or to make permanent those images that express his sentiments, man has looked for materials that would assure certain longevity. The color that comes from a paintbrush is transient, despite all the ways we have found to make it more stable. In Fresco painting, for example, the pigments are laid on wet plaster with a brush so that they may participate in the crystallization of the fresco (plaster), its fate then becomes tied directly to that of the wall and all of the exposure any wall in any environment may face. Mosaic, on the other hand, has always given the impression of stability, of solidity, of everlastingness. I was once involved in the restoration of mosaic pavements from a Siria dating to the Third Century A.D., and I can assure you that their state of conservation, despite being outside and exposed to the elements for centuries, was perfect. Perhaps a synonym for mosaic, then is “duration over time.”Far from being a spontaneous form of artistic expression, mosaic is the product of a rich and refined culture. Indeed, it first flourished within the cultural and geographical boundaries of the Greco-Roman world, along the Mediterranean basin. It is not coincidence that at the same time and in the same place, Platone (Plato), Socrate (Socrates) and Artistotele (Aristotle) were building the foundation of modern thought.In a mosaic, each piece is distinct, yet it only makes sense as a part of a whole; each piece has a unique position, and at the same time contributes to the overall composition. 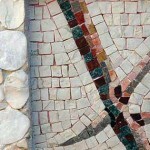 This is a very important concept: the part in relation to the whole, all the many, tiny bits that make up the whole.The Byzantine mosaicists would affix the glass tesserae directly in place, deliberately setting each piece at varying angles with the goal of reflecting as much light as possible. All of these many, tiny pieces, inserted by the mosaicist to create the whole, can now acquire the property of reflecting light. Just as the heavenly bodies in space reflect the sun’s light, the tesserae give the impression of being sources of light themselves. When light hits the tesserae they radiate and reflect it back out so brilliantly that even a dark space can be illuminated.